(Nanowerk News) A Northwestern University-led international team is getting closer to understanding the mysteriously bright object that burst in the northern sky this summer. Margutti presented her findings on Jan. 10 at the 233rd meeting of the American Astronomical Society in Seattle. The research will then be published in the Astrophysical Journal. She is an assistant professor of physics and astronomy in Northwestern’s Weinberg College of Arts and Sciences and a member of CIERA (Center for Interdisciplinary Exploration and Research in Astrophysics), an endowed research center at Northwestern focused on advancing astrophysics studies with an emphasis on interdisciplinary connections. 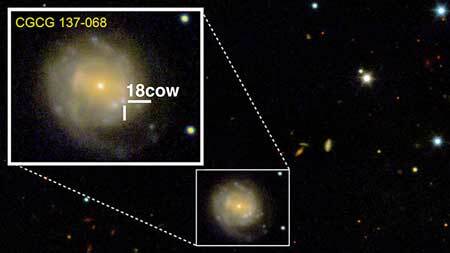 After ATLAS spotted the object, Margutti’s team quickly obtained follow-up observations of The Cow with NASA’s Nuclear Spectroscopic Telescope Array (NuSTAR) and the European Space Agency’s (ESA) INTErnational Gamma-Ray-Astrophysics Laboratory (INTEGRAL) in hard X-rays, with ESA’s XMM-Newton space observatory in soft X-rays and with the Very Large Array in radio waves.